The Numark NV is a DJ controller that is built to be as independent from your laptop as possible. Serato DJ software is included, and with the help of the new displays on the controller, you can keep track of critical musical elements including waveforms, song navigation, track status, and all your effects. This is how all DJ controllers in the future will work, everything at your fingertips. The knobs on the Numark NV are touch activated, which means they react immediately to your touch. You can then carve out your signature sound by giving them a twist, and combine filter sweeps, EQ kills and FX combinations. On each of the channels you can manipulate up to 6 simultaneous FX and this includes the master channel too. The FX controls are capacitive, and they deliver amazing effects with a simple twist or touch. With Serato DJ you can access 12 professional iZotope FX right at your finger tips. There are a total of 16 trigger pads included on the NV. The trigger pads are velocity sensitive, and respond dynamically to touch, and the speed of the touch. This gives you a whole new edge when you are setting loops, triggering samples, and triggering hot cues, or even slicing tracks. You can remix your music on the fly with the trigger pads. They are backlit with RGB too. There are 3 way filter knobs for each channel, and each of the precision filters are controlled with touch activation. The 3 modes that you get wit the filter knobs are basic filter, filter roll, and filter FX. The Numark NV has dual 5 inch platters. They are responsive and robust, and easy to use in a club environment, regardless of the temperature adjustments at the venue. The design of the Numark NV is made out of a reinforced plastic, yet the components all feel high end. The performance pads and the jog wheels are smaller than the Mixtrack Pro 2. 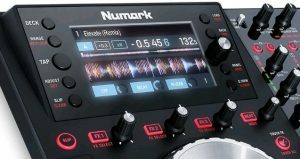 The displays that are a part of the Numark NV are 2 full color screens, and they are angled in the same style as CDJ turntables, located just above the jog wheels. The mixer is a 4 channel one, and has a replaceable crossfader with fat filter knobs for each of the channels. Both the crossfaders can assign switches for each of the channels too. The unit itself is thin yet sturdy. There are 3 controls on the front including the 1/4″ and 1/8″ headphones sockets and split cue, along with volume control. These are on the right hand side of the front, while the headphones sockets on the left. On the rear of the controller you can see that the NV has been built to support software exclusively. There are no inputs for CDJ’s or vinyl decks, so you won’t be able to use the unit with Serato DVS. There is a 1/4″ microphone channel and a twin RCA aux. The 2 screens are full color, and bright enough for dark club environments. Its a welcome addition to a medium range DJ controller, and really allows you to tuck your laptop out of sight, and concentrate on the controller only. This is the first controller on the market to take this dual screen approach. The resolution of the screens are the same as a laptop screen so they are very crisp to read your track listing from. There are 5 controls on each of the screens. They allow you to select the deck that is being controlled, and also the beat gridding, the tempo slider range and keylock. There are controls that allow you to navigate your playlist folders. You can select the main view that gives you the Serato spinning disk with a cue marker on it to help with your scratching. You can also read the time remaining and the BPM that are displayed on the screens. You also get the waveform in basic full track view, and what effects you have selected too. You can tell at a glance what single effect you are controlling, but it can also handle a second and third effect too. There is a small number that tells you exactly what cycle the beat control has been selected. The waveforms look just like they do on your laptop. They scroll smoothly through, and have the same color feedback. You can also switch to a smaller waveform view that is helpful for setting up loops, and also for cueing. There are LED’s located at the top of the mixer that perform the same role as the phase meter in Traktor. This is a great controller that really breaks new ground with its dual screen, and shows the way that others will follow in the Dj controller industry.